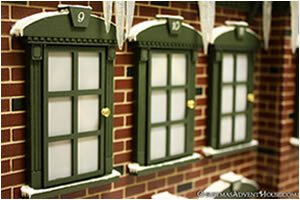 Christmas Advent House offers various options for your house. 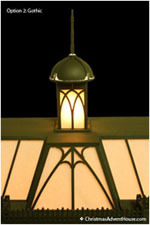 Choose designs of various elements which best reflects your dream house for a unique, custom feel. These options are included with your house. Choose the style that best reflects your dream house. 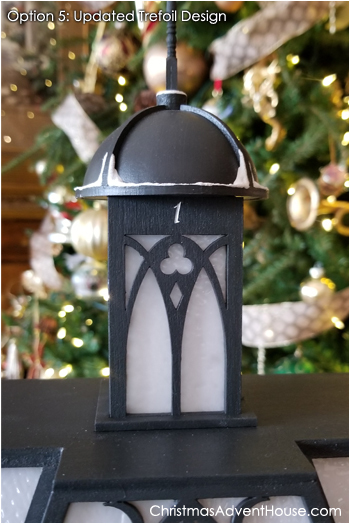 Each house owner can choose from our Original, Gothic, Double Gothic or Trefoil designs and comes standard with each Christmas Advent House. 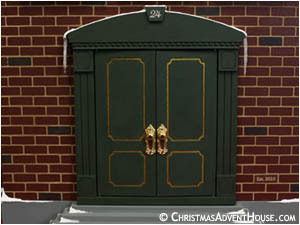 Which door reflects the character of your Christmas Advent House? 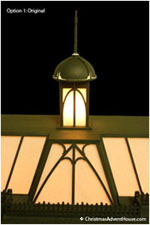 We offer six different designs for your house. 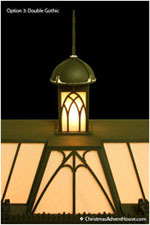 Choose from our Original, Triple Panel Fancy, Triple Panel Box, Double Arch, Triple Arch and Gothic designs. 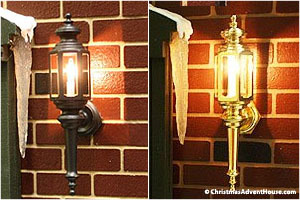 Shown: Original Design (left) and others (with Enhancement Package dentil molding & accent pieces). Door are created in our original Green color. Fence Design (Option Included) Traditional or Gothic? 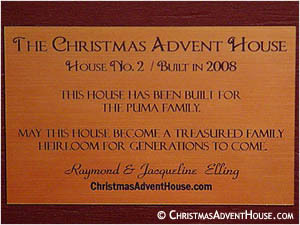 Each Fence Design will completely transform the overall look of your Christmas Advent House. 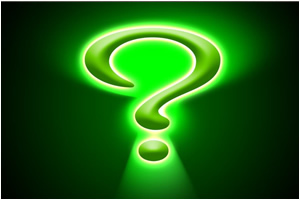 A personal inscription of your choosing may be included. Enhance your holiday with a Christmas Advent House loaded with upgrades for a small additional price. These extras are sure to make your house more grand with a sense of personal style. Add more detail to your house with enhanced window treatments and dentil molding. These decorative additions add a wonderful piece of detail to the house, front door and the tops and side of each window frame. 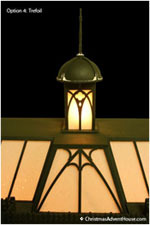 This elegant enhancement adds a touch of sophistication to each house. Some elements of the elnhancement package can also be added to most previously built houses and self-installed. There is nothing more elegant than the soft glow of these magnificent Coach Lights. This extra comes with two (2) Coach Lights that flank the Front Door. 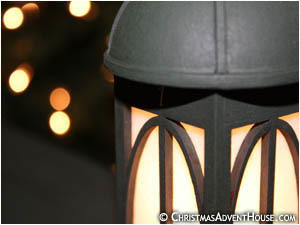 With the flip of a switch, brighten your Christmas Advent House a little bit more. Our newest extra is absolutely majestic! 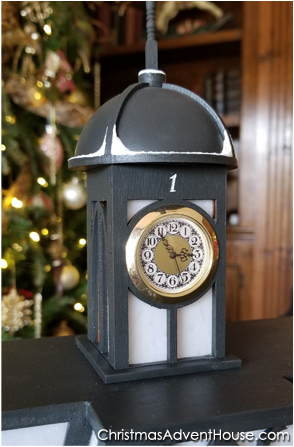 This working Clock Tower will be the highlight of your Christmas Advent House as it countdown the hours to Christmas. Available to new, and existing Homeowners. Existing Homeowners, Click Here to purchase your Clock Tower. 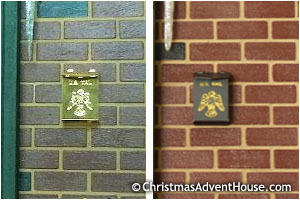 Adding to the detail of the Christmas Advent House, this lovely mailbox adds another dimension to each front door. The mailbox is available in brass or black. 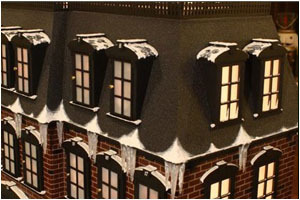 Make your House really come alive with extra dormers which are placed on each side of the 3rd floor. There are two dormers on each side (total of four) and light the Christmas Advent House with a more grand appearance. Have a feature you'd like added to your house? Let us know and our elves may be able to make it happen.